→How to Drive Massive Traffic to Your Blog from Facebook? How to Drive Massive Traffic to Your Blog from Facebook? Normally, an Internet User use Facebook for social networking. However, if you are an owner of a website or Blog, you can use this social networking site for driving a massive traffic as well. For Blog or website owners, more traffic means More Money . That’s why, Traffic is extremely important. I have already explained you the importance of Facebook EdgeRank for a Blog or Website. Today, I am going to provide you some working techniques to drive massive traffic from Facebook to your blog.Facebook is undoubtedly the most popular social networking website in the world. It means, you can drive lots of traffic to your blog through it. If you are not using Facebook, you are committing a mistake so start using it and follow some important tips which has worked for me. For driving traffic from Facebook, there is no need to do anything special. Just change your way of using Facebook. After following certain methods, i have managed to drive tons of traffic to this blog so sharing the same in this article. A survey shows that, Facebook users show more engagement in Posts which contains Big images. Big size images gets around 120% more engagement than normal posts which contains only texts. These kind of posts get more likes,shares,comments etc. To get more Likes, comments and shares on Facebook, try to make your Picture visually appealing. It should be related to your blog’s subject. 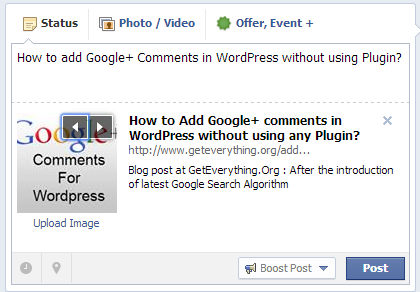 You can’t post a picture of a cute dog in a Facebook Page Page of a Blog which is about Blogging and SEO. 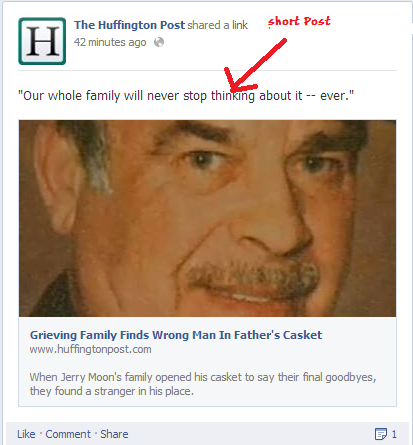 On Facebook, a short post gets more engagement than the long one. Keep your post simple and user friendly. As you can see in the above figure, the question is quite simple but it is most likely that People will love to answer this question because they can predict something about it. If you are using normal texts in your Post, don’t use link. It can have negative impact on your Fans. If you are doing this, they will think that you are only trying to promote your blog. 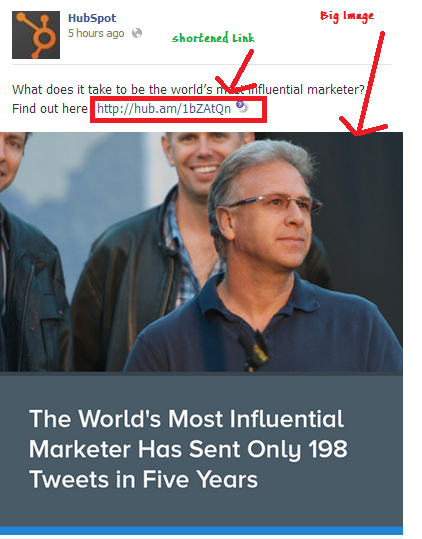 It doesn’t matter whether you are using a shortened url or normal link. Lets see below given example to see, what i want to say. However, if you are using large image in place of normal text, you should use your link so that your Fans can reach to your blog. 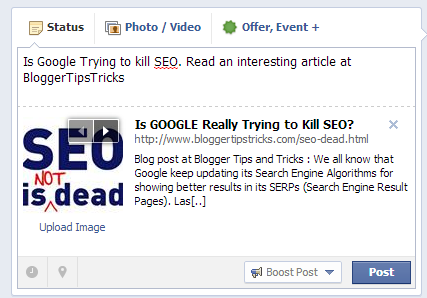 “How to ” articles are helpful for driving traffic from Facebook to your blog because it contains complete tutorial. Most of your Fan will definitely check your “How to” article present on your blog after viewing a simple update of the same Post on Facebook. As you can see in the above figure, I have shared a “How to ” article. If it is interesting for my Fans, they will definitely visit my blog to check the demonstration. Contests and Giveaways are considered important for driving traffic to any blog. 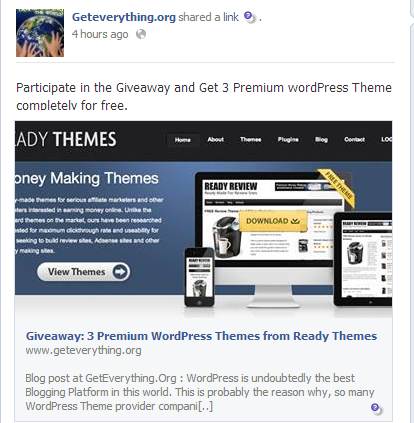 If you are running a Giveaway or Contest on your blog, you must share it on your Facebook Fan Page. Contents or Giveaways are helpful for users because they get items for free so they like it. If you haven’t run any Giveaway or Contents on your blog yet, it’s the right time for you to do that. Conducting a Giveaway or contest on your blog will generate traffic from so many other fields as well. If you are sharing only Pictures and Texts on your Facebook Fan Page, your Fans will get bored very soon. It is important to make them happy all the time so that they continue to visit your blog regularly. For this, you must embed video sometimes as well. Just create a simple but informative video and share it on your Facebook Fan Page. I am pretty sure that, you will get more likes,shares and comments. To drive traffic to your blog, just place a link of your blog as well but it should be a shortened link. Most of the bloggers never share the contents of other blogs on their Facebook Fan Page or any other social networks. If you are among them, you are really making a big mistake. If any particular article or infographic is helpful for users, don’t hesitate to share it on your Facebook Page. It will not only increase user’s engagement on your Facebook Page but will also make your relation better with other bloggers. Never think that, sharing the content of other bloggers will transfer your fans towards them. Just try to share helpful contents on your Facebook Page. If you are financially strong or an established blogger, you can drive massive traffic from Facebook to your blog by using Facebook Ads. Just advertise your blog on facebook after paying them their charge. In result, they will give you genuine visitors. 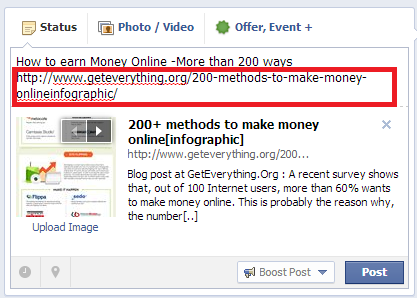 However, this method is not helpful for new bloggers who can’t afford to advertise their blog of Facebook. I started applying above methods few months ago and got unexpected result with it. That’s probably the reason why, i decided to share it here. These days so many young bloggers are posting wrong information or tactics on their blog which harms users instead of helping. If you are an user, go through the reputation of a blogger before applying his tricks and tactics.Apply the above provided methods for driving massive traffic from facebook to your blog and give me the feedback via comments. Your comments are really precious for me so don’t keep yourself silent.